Nicole Raebel is a recent graduate of the University of St. Thomas School of Law. Prior to attending law school, Nicole attended Winona State University and received her Bachelor’s degree with a major in Communication Studies and a minor in Political Science. 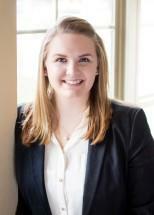 Nicole began working with Jaspers, Moriarty & Wetherille during law school as a Law Clerk. After spending almost 2 years clerking with Jaspers, Moriarty & Wetherille, the firm hired Nicole as an Associate Attorney following her admission to the bar. Nicole has both transactional and litigation experience through her work as a Student Certified Attorney with Clearwater and Pennington County attorney’s offices, and as a Law Clerk to General Counsel at a local Minneapolis tech company. She was also a Volunteer Investigator for two years with the Minnesota Office of Lawyers Professional Responsibility’s 4th District Ethics Committee. Nicole was born and raised in Minnesota, enjoys volunteering in the community, and looks forward to becoming involved in local programs and organizations. Nicole maintains a general legal practice including primarily: debtor/creditor, family, business, contract, estate planning and general civil litigation.